“Networks seem to do better when tended by the deft and gentle hand of a facilitative leader rather than the executive hand of a director.” An important point, and I would extend and qualify it by saying that facilitative leadership in our view and experience is a shared undertaking, inclusive of key and distributed functions such as convening, process design, facilitation, weaving, coordination, and curation, among others. “Organizational self-interest must be a component of network participation – though not the exclusive or even primary driver.” This is what amounts to the “network bargain,” mutually interdependent individual and collective gain. The problem with leading only or foremost with self-interest is that it can limit trust, emergence and “growing the pie” of resources. “Approach network participation expecting wide variation in perspectives and differences in problem solving approaches.” This is inevitable, provided we have assembled a diverse array of stakeholders addressing a complex issue. We have found it to be important to embrace a both/and rather than an either/or attitude when it comes to strategy in these situations, the silver buckshot over the search for the silver bullet. “One network advantage is that groups can maintain their autonomy and march to their own beat, even as the network setting helps them align their efforts with other groups.” This is what it means to embrace different functionality in networks, including connectivity, alignment, and collective action. Network “action” includes individual actors and “twosies” going off and doing their own work in the spirit, vision, and purpose of the network. It’s about self-organization, not permission. “Member insistence that everyone see ‘the problem we’re trying to address’ in exactly the same way [is] a formula for endless argument and needless conformity.”Indeed, part of the reason for engaging a diverse network of actors is to gain the benefit of different, equally valid, and together more holistic perspectives of the problem. “Networks do better when they apply network planning simplicity rather than strategic planning complexity.” We agree and advocate iterative strategy development over strategic planning, finding systemic leverage points over detailed action plans. “Representatives need to realize that fluid factors in the external environment require networks to remain nimble in reorganizing priorities.” Networks working to change and evolve systems of which they are a part, is all about life working with life. Life is process, and so things are in constant flux. This is where we are called to be constantly adaptive in our work. “Insistence upon particular approaches to and methods for solving problems [is] a scenario likely to impair creative thinking and hinder effective action.” At times collaborative efforts can devolve into “tactical sectarianism,” warring over whose approach is the best. In fact, what may be needed is many different approaches as well as those no one has yet considered. “Impatience with ‘process’ among network members habituated or predisposed to action [is] a leaning that fails to recognize the extent to which – in network settings just like any classic organization – helping people understand and evaluate what they are doing generally produces a better result than if people act blindly or with partial knowledge.” Amen. I would also add that if we understand that social structures are largely constructed through process, we might be more willing to play with and engage in procedural prototyping as a means of making change. As Peter Block has provocatively asked – What if in every gathering we individually and/or collectively made some commitment to bring a piece of the future we desire into the present? How might we talk differently? Meet differently? “Too easily dismissed as touchy-feely, relationship building . 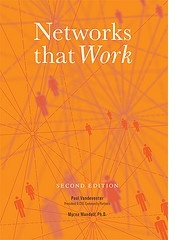 . . lies at the core of effective networks.” Amen again and again. More here on some ways to cultivate relationships and trust. Thanks for this resource Curtis — very useful. Can you point me towards additional resources that explore #6?